Big Bend Ranch is by far the largest state park in Texas, and probably the least well-known, since it lies in the most remote part of the state, occupying a large part of the desert west of Big Bend National Park. The land is mostly roadless, with harsh, irregular terrain and extreme temperatures most of the year - Presidio and Lajitas, the two small towns at either side, often vie to be the hottest place in Texas, and sometimes (in spring and early summer) in the whole US. They usually top 100°F for the first time during April and may still do so in October. In recent years the park has become a little more developed, with new trailheads and roadside notices, and improved access points along the Rio Grande, yet the majority of the region remains wild, unspoilt, and difficult to access. The park adjoins a wild stretch of the Rio Grande and is most notable for the one paved highway through this region - Farm Road 170, El Camino del Rio (The River Road - see map); for over 60 miles this narrow, especially scenic highway dives up and down steep ridges, across desert and through canyons alongside the river, past splendid, empty Chihuahuan Desert landscapes. En route are a few trails, picnic tables and viewpoints, plus parking areas and side tracks to the river for primitive camping, fishing and boating access. One of the more unusual picnic spots is towards the east of the park at The Tepees, Madera Canyon - a collection of Indian-themed shelters beside the road with good views over the Rio Grande; another interesting site is the remains of the Contrabando Movie Set, a Mexican-style village used for several little-known films such as Rio Diablo and Streets of Laredo, but now presenting quite an aged and authentic appearance. For camping there are three official sites beside the river (Colorado Canyon, Madera Canyon and Grassy Banks), plus a few other secluded places where overnight stays are possible, such as along the short side road to the West Contrabando Trailhead, the start point for the Dome Trail. 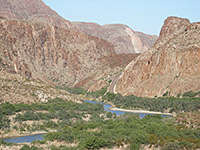 The Rio Grande is for the most part wide, fairly shallow and usually slow-moving, flowing in some places through a broad valley bordered by gently sloping sides, elsewhere through deep canyons with rapids, such as Colorado Canyon, near which the road reaches its maximum gradient of 15%. One unusual tributary well worth a visit is Closed Canyon, a deep, narrow, slot-like ravine through cliffs near the Rio Grande. The only other (relatively) popular trail is along Rancherias Canyon, a longer tributary of the river that heads northwards through a mountain range, though the recently enhanced West Contrabando and East Contrabando trailheads also give easy access to various canyons and ridges in the southeast of the park. 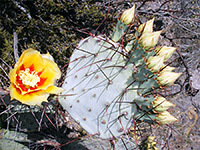 Away from the Rio Grande, the vast interior of Big Bend Ranch State Park is reached only by a few unpaved tracks, and although the main entrance route is graded and generally suitable for all vehicles, the surface is bumpy and dusty, and a drive of between 15 to 50 miles is necessary to see the various points of interest. The north side of the river valley is bordered by a rugged mountain range, beyond which are many canyons, desert plains, plateaus and isolated peaks. The most unusual geological feature is the Solitario, an ancient volcanic caldera 9 miles in diameter, containing many twisted, curving rocky ridges, but this is quite difficult to reach, requiring a drive of 33 miles on the park road, 6 miles down a rougher, high clearance track followed by a hike of a few miles. 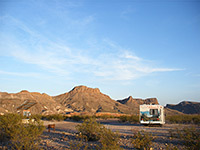 The ranch after which the area is named is located nearby, while also along the park road are many trailheads and primitive campsites, some at the end of side tracks of varying quality, and there is enough wilderness for several weeks exploration, even though much of the landscapes are not especially remarkable, similar to many other deserted mountain ranges in west Texas. Trails are still being constructed; when complete the system will total 236 miles, offering varied levels of difficulty, and including many routes suitable for horses and cycles. 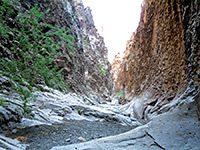 Two of the easier sites to reach are Ojito Adentro, a riparian ravine with a good variety of vegetation, and Cinco Tinajas, a series of waterholes in a narrow canyon.